Obsession. That is the word that describes Francis Falceto. He is the man behind the twenty three volume, and counting, Éthiopiques series on Buda Music. In April of 1984, a friend of his lent him a copy of a Mahmoud Ahmed album. A month later, he went to Ethiopia. Although it would be over a decade before the Éthiopiques discs started showing up in record shops around the world, he was responsible for the first release abroad of modern Ethiopian music with the reissue of Mahmoud Ahmed’s 1975 album “Erè Mèla Mèla” for Crammed Discs in 1986. But it is surprising, that in the span of the twenty three discs and two DVDs that have been released since 1997, that there is still plenty of territory that has yet to be covered. The music of Ethiopia is the result of a very specific series of events. First, there is Emperor Haile Sellassie’s visit to Jerusalem in 1923. While he was there, two significant things happened: He heard brass band music for the first time and he met the “Arba Lijoch”. The “Arba Lijoch” were a group of forty Armenian orphans (Amharic “forty children”) living at the Armenian monastery in Jerusalem, who had escaped from the Armenian genocide in Turkey. They impressed Haile Selassie so much that he obtained permission from the Armenian Patriarch of Jerusalem to adopt them and bring them to Ethiopia, where he then arranged for them to receive musical instruction. They arrived in Addis Ababa on September 6, 1924, and along with their bandleader Kevork Nalbandian to become the first official orchestra of the nation. Nalbandian’s nephew, Nerses Nalbandian – who was a composer, arranger, chorus leader, and music teacher, would go on to become a core person to develop modern music in that country. Throw in Peace Corps volunteers bringing records from America, as well as the American military radio at Kagnew Station in neighboring Eritrea broadcasting the latest R & B, Soul, Rock and Pop hits, and you have a potent combination of influences that produced one of the most unique musical movements found in any country at that, or really any, point in time. But all of that ended in 1975, when the Derg ousted Emperor Haile Selassie from power. The Derg, which means “committee” or “council” in Ge’ez, is the short name of the Coordinating Committee of the Armed Forces, Police, and Territorial Army and was a communist military junta led by a committee of military officers. Under their rule, the nightlife of Addis Ababa faded away and the record labels disappeared. The musicians were unable to leave the country, since emigration became almost impossible and they needed an exit visa to leave the country. The music may never have left Ethiopia, if it were not for the few vinyl records that managed to find their way out into the rest of the world. The only information that I have been able to find about Tezera Haile Michael, is that he was primarily a songwriter and arranger, who’s songs that were recorded by Bezunesh Bekele, Mahmoud Ahmed (on all of his self released singles) and Tilahoun Gessesse. I have also seen him credited as a back up singer for some of the early recordings of the Imperial Body Guard Band, who are the backing band on this record. As far as I know, this was his only recording where he was the featured vocalist. 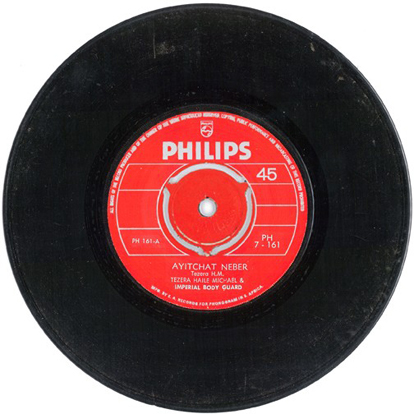 Catalog number PH 7-161 on Philips Records Ethiopia. No release date listed. Nice article – as always!!! Do you mind if I share this with my visitors @ http://www.AddisTunes.com ? A really nice introduction of music of Ethiopia. As said Éthiopiques series represents the music genre very well. Was luck enough one of their concerts.